I took advantage of a few leftovers when I planned tonight's meal. I had maybe 1/4 cup of creamy carrot-ginger soup from a few days ago, as well as a purchased quinoa with asian slaw salad from Whole Foods Market. The soup had cashews and the salad had a little tahini, so I am calling this an "almost no added fat"* meal. I put my Saladmaster saute pan on medium and put in about a third of a sweet onion cut into thick half-moons (maybe 1/2" wide). I let the onion cook, with no added fat or liquid, for a few minutes till they were getting cooked but not carmelized, then I added 2/3 of a package of tempeh. I had first cut the tempeh to be half as thick, then cut into approximately 1" squares. I served this with the prepared salad and some very tasty slices of heirloom tomato. It was a good and tasty dinner! The carrot-ginger soup that I make is pretty thick, and by cooking it down here, it really was more a sauce by the time I was done with it. I cooked for about 3 more minutes, till the soup/sauce was largely absorbed. 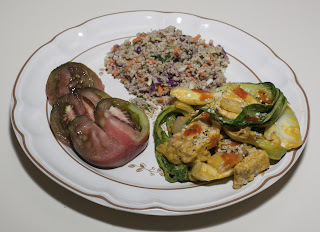 I would also have liked to have included a little Cajun or other spice, or perhaps a little jalapeno, but, in interests of serving my daughter as well as us, I just put some hot sauce on our individual plates. *Let's see ... the whole batch of soup, maybe 8 cups, had about 1/2 cup of cashew, but I had only had about 1/4 cup of soup left. The salad was part of Whole Foods' Engine 2 low-fat diet. Cashews have 62g of fat in a cup, so they probably contributed (1/32 soup * 31g fat/whole batch of soup) only a gram or so of fat. I had to put a meal together relatively quickly, and was able to prepare a reasonable dinner in about 20m tonight. 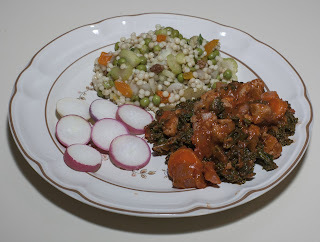 I had the Israeli couscous dish leftover from yesterday; it's meant to be served cold, so that just had to be served. I cut up some Easter Egg radishes for a secondary salad. Now on to the main course! I put in one of my heavy stock pans a little less than a quarter of a medium Vidalia onion, cut into maybe 3/8" cubes, turned the pan on medium, and cooked, stirring occasionally, till almost at the point of being clear (bit of translucence on edges, but otherwise still white), about 3 minutes (I use a premium pan that needs no oil or water to keep food from sticking!). I then added a finely diced clove of garlic and an 8 ounce box of cubed seitan, including the little bit of liquid that comes with the seitan, and cooked, again stirring occasionally, for about two minutes. I then added a carrot, sliced to about 1/4" width, and about four leaves of kale, roughly hand cut into approximately 1" pieces of leaf (stem left behind). I stirred for a minute, then added about two tablespoons of 1/4" diced sweet onion (I like putting onions in at different times of cooking to get different mouth feels), about half a cup of marinara sauce, a pinch or two of salt, about a half teaspoon of dried oregano, and two tablespoons or so of nutritional yeast. I would also have added some crushed red pepper, but my preschooler wouldn't have eaten the dish (I did add some crushed red pepper to my serving). I stirred, reduced the heat to low, and simmered for a few minutes. Dinner was fast, nutritious with no added fat (the whole box of seitan was maybe 3g of fat), and tasty! I'd love to make similar stews with seitan and marinara, but try adding cellophane noodles or orzo, and use other vegetables. In the Food For Life classes that I teach, the Kickstart your Health seven-week series got recipe revisions several weeks ago. Here is the new week six recipes (I added some tasty English Peas) that I prepared for us at home - I will be making this in my class at Duke University tomorrow. Yum! 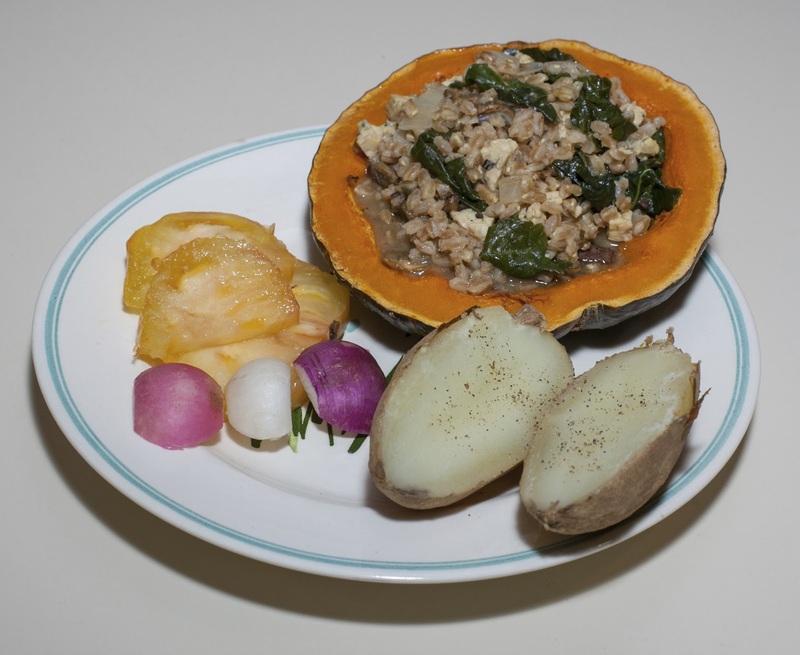 I shopped at Weaver Street Market after a class that I taught this afternoon and found some pearled farro as well as a lovely kabocha squash. (I subsequently found out that this nutritious grain is even more healthful if semi-pearled, and I'll look for this.) Yesterday, we had picked up some pretty "Easter Egg" radishes. 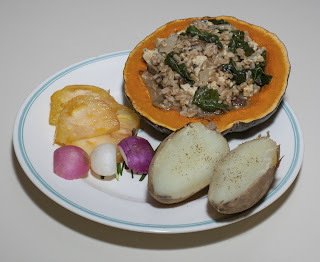 I came up with the idea of making a stuffed squash with farro as the base. 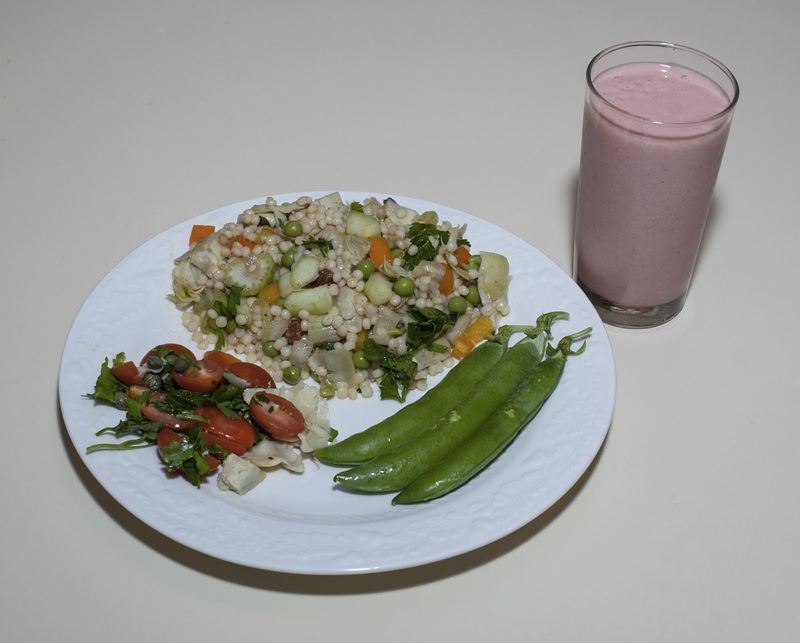 The following describes my preparation, starting with the ingredients that I used. Dinner was good! I'd like to make more dishes with this chewy and tasty grain, and see if I can get less processed farro. I found in my pantry a bottle of Bonnie Blue's Blue Ribbon Squash Relish (squash, onion, sugar, vinegar, pepper, salt, spices), which I had purchased at A Southern Season, a local specialty store. I recently purchased some bean thread (or glass or cellophane) noodles (mung bean starch and water) after enjoying them at a friend's house, and came up with the idea of serving the tasty relish atop the noodles. I let the noodles soak in near boiling water for 15m or so. I ended up with extra noodles and could have used about 3/4 of the package. In a stainless steel saute pan, I put most (about 4/5) of the onion and turned the pan onto medium-high. I use a quality Saladmaster pan that doesn't need added oil for cooking - and hence no preheating is necessary. I stirred the onion for about a minute, then added the seitan, reserving the marinade. I frequently stirred the seitan and onion; after about 3 or 4 minutes, I added a little bit of the marinade (the pan immediately then upon a slight rub with the spatula released the dark areas of cooked on food), and continued stirring, continuing slowly to add all of the marinade over a few minutes. After the seitan was showing slight browning, I added the bell pepper and continued stirring for another 2 minutes or so. I added the reserved raw onion, stirred occasionally for another 2 minutes or so, then mixed in a bit of salt and jerk seasoning to taste, and served. 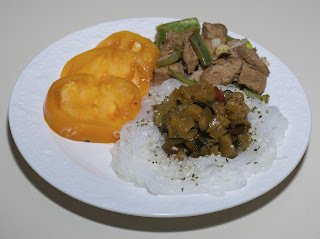 I made a mount of the noodles (no need to drain as the water had been absorbed) and served the relish in the middle. I sprinkled a half teaspoonful or so of hemp seeds around the outside. Slices of tomato completed the plate. Dinner came out well. I have been enjoying no-added-fat cooking. Though this can result in reasonably browned onion (especially if no liquid like the lime/lemon juice were added), seitan gets crisper if cooked with a little bit of oil. For a moderate fat dish, the seitan could be cooked separately in a little bit of olive oil and mixed in with the onion and bell pepper; I think this would be a good choice to allow for a little bit of oil but, in this case, better texture and flavor of the seitan. I've never used bean thread noodles before, and want to work with them again. I'd love to make a soup, which such noodles are more typically used for. The relish is good and has no fat; I ended up with maybe an eighth of the bottle unused, and will probably use it for topping bread or crackers as a nice snack. If I were to make such a relish, I'd reduce or leave out the sugar - and reduce the vinegar, as well. I had intended to make a simple late dinner to include a basic pizza on bread, but it turned out there was one last slice of a non-sweet bread; I used that to make a slice for my daughter. For us, I had to use a pecan-raisin bread as the base. 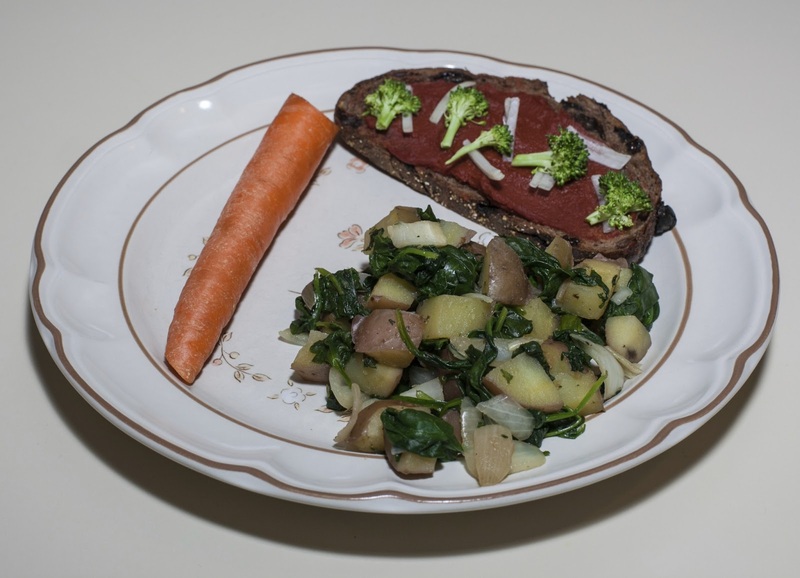 The main course was a potato and spinach saute, cooked in a stainless steel pan without any added fat or liquid. The "pizza" was a little strange, but the potato-spinach dish was good.